If you’re going to go for store-bought pesto, I highly recommend seeking out one from the chiller section. My Irishman and I did a tasting of commercial pestos recently, and while the jars were pretty ordinary, we found the fresh ones to be better than we expected. Freshen up commercial pesto with some grate parmesan and a handful of toasted pinenuts if you have time. 1. Bring about 5cm (2in) salted water to the boil in a medium saucepan. 2. Put chicken between two pieces kitchen paper or clingfilm and bash with the base of a saucepan until you have 4 pieces about 5mm (1/4in) thick. 3. Mix chilli with 1 tablespoon olive oil and coat the chicken. Season. 4. Put beans in boiling water and simmer for 4 minutes or until no longer crunchy. Drain. 5. Meanwhile, heat a large frying pan or skillet. Cook chicken on a high heat for approximately 2 minutes each side, or until cooked through. 6. 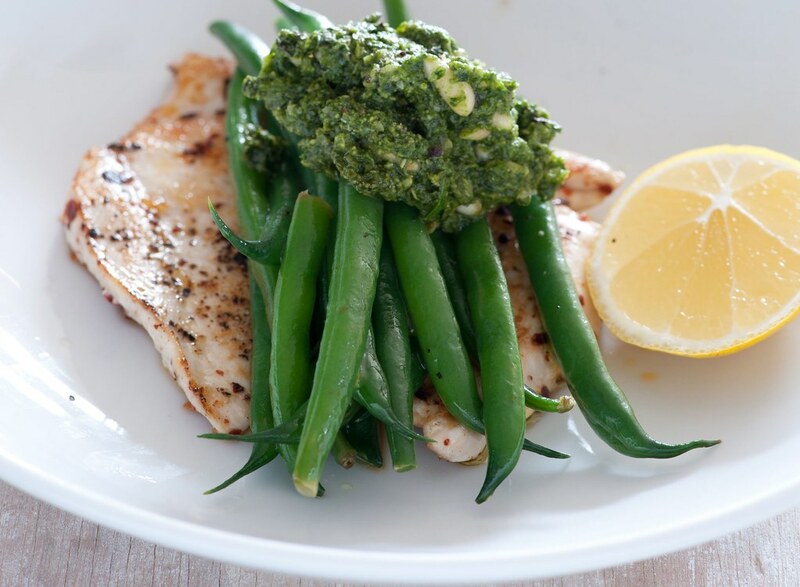 Divide chicken between plates and top with beans and pesto. Serve with lemon. vegan – replace the chicken with slices of grilled aubergine, and use basil oil instead of the pesto. vegetarian – use tofu instead of the chicken, or finely slice halloumi and pan-fry in a little oil until golden on both sides, around 3-4 minutes. You could also replace the chicken with a fried egg. short on time? – replace the beans with snow peas (mange tout) and skip the cooking step. dairy-free – use basil oil or mayo instead of the pesto OR try this dairy-free pesto. carb lovers / more substantial – toss cooked pasta in with the bean and pesto. Or serve with roast, steamed or mashed spuds. more substantial (low carb) – add avocado. more veg – snow peas, sugar snap peas, asparagus (cook with the beans). chilli flakes – keep it in the pantry. green beans – can be frozen but best to use for another meal. pesto – commercial jars of pesto will keep for months in the pantry. Fresh pesto will keep in the fridge for a few weeks. Cover with olive oil to prevent exposure to air and browning reactions. lemon – will keep for a few weeks at room temp or for much longer in the fridge. made a modified version of this tonight. We had a big harvest of green beans from the garden and some leftover rotisserie chicken. So, I steamed the green beans, spooned a few tablespoons of delicious Stonewall Kitchen Kale & Arugula pesto over them and plopped some pieces of reheated rotisserie chicken over that. Garnished with a few halved cherry tomatoes for color and it was delicious! Loving the sound of that Kale & Arugula Pesto Ellie! I know it sounds silly, but my favourite thing about this recipe is the halving the lemon on the diagonal… a revelation! That’s not to denigrate the rest of the recipe, it was the perfect weeknight meal. Not silly at all Matilda! Form and function! I found it squeezed much easier as well as looking awesome.